Transportation costs are typically a household’s second largest expense after housing. Low income households are especially burdened by transportation costs, with low income households spending up to two times as much of their income on transportation than higher income households (Litman, 2013). Thus, access to location efficient housing is especially important to low income households, including those who use a housing voucher to help pay for housing costs. 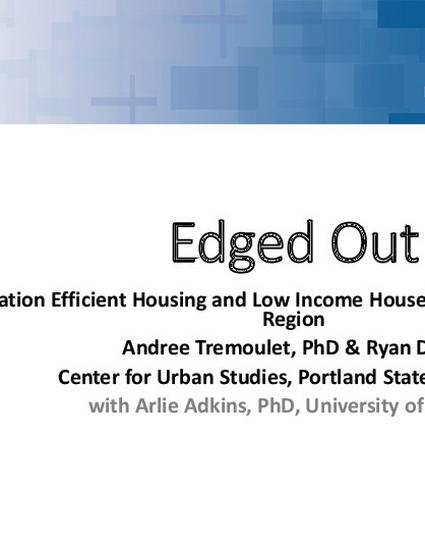 This seminar presents the results of a two-year project supported by the Portland region's four public housing authorities to design and test tools to help people with housing vouchers find location efficient housing. We examine the challenges that residents faced and discuss policy implications. Andrée Tremoulet, Ph.D., is a Research Associate with the Center for Urban Studies at Portland State University. Her research focuses on the intersections of housing, transportation, land use and people and places at the fringe. Ryan Dann is a Ph.D. student in the School of Urban Studies & Planning at Portland State University. His research involves understanding newcomers’ travel behaviors, and interactions between transportation, neighborhood change, and equity.